Your username or URI for the sip server. You password when you want to logon or REGISTER on the sip server. The sip server to use. Format is URL:port. When no port is specified, port 5060 is used. 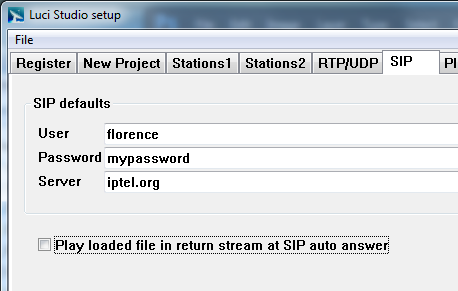 Play loaded file in return stream at SIP auto answer. When you enable this the loaded file will be played for the caller after LUCI automatically picks up the call.